Recent trends in the worldwide medical device industry indicate that national expenditure on healthcare services in Korea has been growing steadily with contributing factors including an aging population, development of healthcare technologies, higher interest in the quality of life, etc. National health expenditure as a percentage of GDP in Korea is expected to be 7.4 per cent of GDP by 2019. This suggests that the medical devices industry will become even more important. The world’s medical device market is expected to grow from $340.2 billion in 2014 to $467.7 billion in 2019. The US captured a 39.3 per cent market share with $133.8 billion dollars in 2014, followed by Japan with $31 billion (9.1 per cent) and Germany with $26.8 billion (7.9 per cent). In Korea the medical devices market was worth $5.8 billion in 2017, growing by 7.8 per cent compared to the previous year and 5 per cent annually on average since 2012. 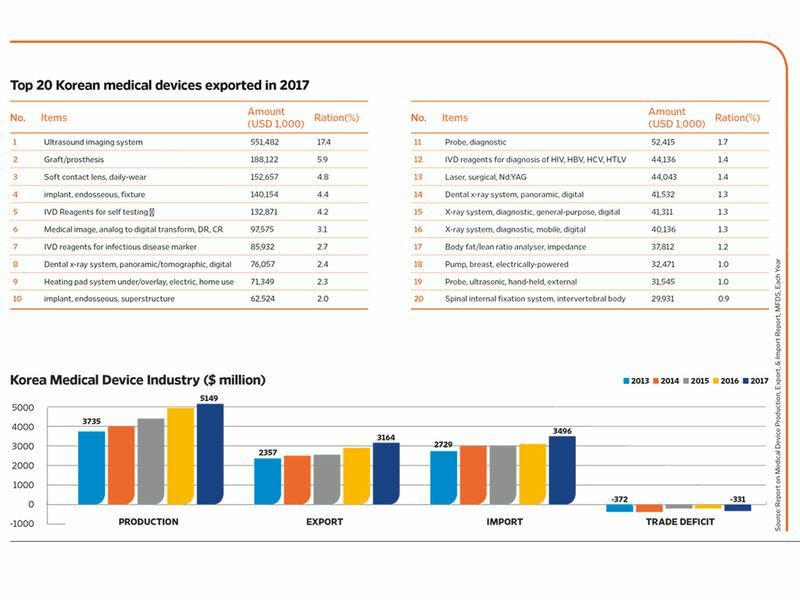 The export and import of medical devices grew by 8.4 per cent and 10.9 per cent, respectively, in 2017 compared to 2016. The US and China were the top two importers of Korean medical devices, with the UAE ranking 17th on the list. Ultrasounding imaging systems, grft/prosthesis and soft contact lenses were among the top exports for Korea in 2017 (see table). Korean medical device companies mainly produce IT-based products such as ultrasound imaging systems, dental CT, and PACS (picture archiving and communication systems), retaining a near infinite potential for high technology and production capacity. Korea’s medical information systems including EMR (electronic medical record), PACS, etc., are gaining recognition internationally with overseas exports growing steadily with Korean PACS maker, Infinitt Healthcare for instance exporting its products to 1,100 healthcare institutions across 38 countries such as the US, UK, Japan and Germany. Large Korean companies have recognised select medical devices as promising business avenues, and are making their presence felt in the industry. 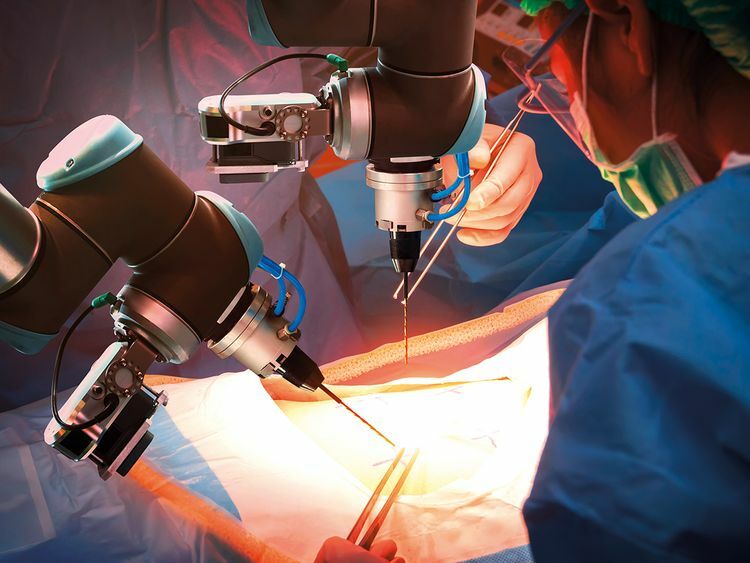 Samsung has entered the hi-tech imaging systems, SKT and the in-vitro diagnosis system markets, while Hyundai is involved in robot surgery systems. Large Korean firms are also promising industrial technologies such as the world’s first large-scale U-Health pilot project and development and commercialisation of the world’s smallest SPR biochip analysis system. Diverse niche markets exist in the medical device market since the industry needs variety and small production volumes. Korean medical device companies have penetrated markets with more than 4,500 products, manufactured by over 200 Korean companies and that have been certified by the US FDA. As of 2014, Korean medical devices were being sold in 198 countries worldwide. Most dental materials were imported from other advanced nations due to insufficient basic research; now, however, they are being exported to other countries along with other key products such as stents, artificial joints and more.